Leonhard Euler (15 April 1707 – 18 September 1783) was a Swiss mathematician and physicist, considered to be one of the greatest mathematicians of all time. Mathematicians have tried in vain to this day to discover some order in the sequence of prime numbers, and we have reason to believe that it is a mystery into which the human mind will never penetrate. Variant: Madame... I have come from a country where one can be hanged for what one says. All the greatest mathematicians have long since recognized that the method presented in this book is not only extremely useful in analysis, but that it also contributes greatly to the solution of physical problems. For since the fabric of the universe is most perfect, and is the work of a most wise Creator, nothing whatsoever takes place in the universe in which some relation of maximum and minimum does not appear. Wherefore there is absolutely no doubt that every effect in the universe can be explained as satisfactorily from final causes, by the aid of the method of maxima and minima, as it can from the effective causes themselves. Now there exist on every hand such notable instances of this fact, that, in order to prove its truth, we have no need at all of a number of examples; nay rather one's task should be this, namely, in any field of Natural Science whatsoever to study that quantity which takes on a maximum or a minimum value, an occupation that seems to belong to philosophy rather than to mathematics. Since, therefore, two methods of studying effects in Nature lie open to us, one by means of effective causes, which is commonly called the direct method, the other by means of final causes, the mathematician uses each with equal success. Of course, when the effective causes are too obscure, but the final causes are more readily ascertained, the problem is commonly solved by the indirect method; on the contrary, however, the direct method is employed whenever it is possible to determine the effect from the effective causes. But one ought to make a special effort to see that both ways of approach to the solution of the problem be laid open; for thus not only is one solution greatly strengthened by the other, but, more than that, from the agreement between the two solutions we secure the very highest satisfaction. La construction d'une machine propre à exprimer tous les sons de nos paroles , avec toutes les articulations , seroit sans-doute une découverte bien importante. … La chose ne me paroît pas impossible. It would be a considerable invention indeed, that of a machine able to mimic speech, with its sounds and articulations. … I think it is not impossible. It will seem a little paradoxical to ascribe a great importance to observations even in that part of the mathematical sciences which is usually called Pure Mathematics, since the current opinion is that observations are restricted to physical objects that make impression on the senses. As we must refer the numbers to the pure intellect alone, we can hardly understand how observations and quasi-experiments can be of use in investigating the nature of numbers. Yet, in fact, as I shall show here with very good reasons, the properties of the numbers known today have been mostly discovered by observation, and discovered long before their truth has been confirmed by rigid demonstrations. There are many properties of the numbers with which we are well acquainted, but which we are not yet able to prove; only observations have led us to their knowledge. Hence we see that in the theory of numbers, which is still very imperfect, we can place our highest hopes in observations; they will lead us continually to new properties which we shall endeavor to prove afterwards. The kind of knowledge which is supported only by observations and is not yet proved must be carefully distinguished from the truth; it is gained by induction, as we usually say. Yet we have seen cases in which mere induction led to error. Therefore, we should take great care not to accept as true such properties of the numbers which we have discovered by observation and which are supported by induction alone. Indeed, we should use such discovery as an opportunity to investigate more exactly the properties discovered and to prove or disprove them; in both cases we may learn something useful. Original title: Introductio in analysin infinitorum. Translated as Introduction to Analysis of the Infinite (1988–89) by John Blanton (Book I ISBN 0387968245; Book II ISBN 0387971327 (online version). A conjecture about the nature of air, by which are to be explained the phenomenon which have been observed in the atmosphere (Conjectura circa naturam aeris, pro explicandis phaenomenis in atmosphaera observatis) (1870) (online version). François Arago; Variant: Euler calculated without apparent effort, as men breathe, or as eagles sustain themselves in the wind. Of no little importance are Euler's labors in analytical mechanics. ...He worked out the theory of the rotation of a body around a fixed point, established the general equations of motion of a free body, and the general equation of hydrodynamics. He solved an immense number and variety of mechanical problems, which arose in his mind on all occasions. Thus on reading Virgil's lines. "The anchor drops, the rushing keel is staid," he could not help inquiring what would be the ship's motion in such a case. About the same time as Daniel Bernoulli he published the Principle of the Conservation of Areas and defended the principle of "least action," advanced by P. Maupertius. He wrote also on tides and on sound. Florian Cajori, A History of Mathematics (1893) "Euler, Lagrange and Laplace" p. 240. Somebody said "Talent is doing what others find difficult. Genius is doing easily what others find impossible." ...by that definition, Euler was a genius. He could do the seemingly impossible, and he did it throughout his long and illustrious life. ...Way to Go, Uncle Leonhard! William Dunham, "A Tribute to Euler" (Oct 14, 2008) 49:10, Clay Public Lecture, Harvard University Science Center, from the Clay Mathematics Institute. Euler lacked only one thing to make him a perfect genius: He failed to be incomprehensible. Ferdinand Georg Frobenius, as quoted by William Dunham, "A Tribute to Euler" (Oct 14, 2008) 48:27, Clay Public Lecture, Harvard University Science Center, from the Clay Mathematics Institute. The study of Euler's works will remain the best school for the different fields of mathematics and nothing else can replace it. Carl Friedrich Gauss, as quoted by Louise Grinstein, Sally I. Lipsey, Encyclopedia of Mathematics Education (2001) p. 235. It is customary to consider Chebyshev, Gauss, Jacobi, and Legendre as the main creators of the theory of orthogonal polynomials. However, their contributions were directly influenced by Brouncker and Wallis who, in March of 1655, made discoveries which influenced the development of analysis for the next hundred years. Namely, Wallis found an infinite product of rational numbers converging to 4/π and Brouncker gave a remarkable continued fraction for this quantity. ...The only mathematician who understood the importance of these discoveries was Euler. ...he felt that the recovery of the original Brouncker's proof could open up new perspectives for analysis. As usual, Euler was right. Mariano Giaquinta, Stefan Hildebrandt, Calculus of Variations I (2004) Grundlehren der mathematischen WissenSchaften Vol. 310. Galileo does not attempt any theory to account for the flexure of the beam. This theory, supplied by Hooke's law, was applied by Mariotte, Leibnitz, De Lahire, and Varignon, but they neglect compression of the fibres, and so place the neutral in the lower face of Galileo's beam. The true position of the neutral plane was assigned by James Bernoulli 1695, who in his investigation of the simplest case of bent beam, was led to the consideration of the curve called the "elastica." This "elastica" curve speedily attracted the attention of the great Euler (1744), and must be considered to have directed his attention to the elliptic integrals. Probably the extraordinary divination which led Euler to the formula connecting the sum of two elliptic integrals, thus giving the fundamental theorem of the addition equation of elliptic functions, was due to mechanical considerations concerning the "elastica" curve; a good illustration of the general principle that the pure mathematician will find the best materials for his work in the problems presented to him by natural and physical questions. A. G. Greenhill, Nature (Feb. 3, 1887) Review of A History of the Theory of Elasticity, Volume 35, pp. 313-314.
Who has studied the works of such men as Euler, Lagrange, Cauchy, Riemann, Sophus Lie, and Weierstrass, can doubt that a great mathematician is a great artist? The faculties possessed by such men, varying greatly in kind and degree with the individual, are analogous with those requisite for constructive art. Not every mathematician possesses in a specially high degree that critical faculty which finds its employment in the perfection of form, hi conformity with the ideal of logical completeness; but every great mathematician possesses the rarer faculty of constructive imagination. To the reader of today much in the conception and mode of expression of that time appears strange and unusual. Between us and the mathematicians of the late seventeenth century stands Leonhard Euler... He is the real founder of our modern conception. However non-rigorous he may be in details: he ends and conquers the previous epoch of direct geometric infinitesimal considerations and introduces the period of mathematical analysis according to form and content. Whatever was written after him on the logarithmic series is necessarily based no longer on the already obscured predecessors in the receding mathematical Renaissance, but on Euler's Introductio in analysin infinitorum... in which the entire seventh chapter [De Quantitabus exponentialibus ac Logarithmis] treats of logarithms. Josef Ehrenfried Hofman, "On the Discovery of the Logarithmic Series and Its Development in England up to Cotes" (Oct., 1939) National Mathematics Magazine, Vol. 14, No. 1, pp. 37-38. Pierre-Simon Laplace, as quoted in Calculus Gems (1992). variant: Read Euler, read Euler. He is the master of us all. As quoted by S. H. Hollingdale, "Leonhard Euler (1707-1783): A Bicentennial Tribute", Bulletin (1983) Volumes 19-20, Institute of Mathematics and Its Applications, & by Edwin Joseph Purcell, Dale E. Varberg, Calculus with Analytic Geometry (1987), Vol. 1. He was later to write that he had made some of his best discoveries while holding a baby in his arms surrounded by playing children. In 1736, during his first stay in St. Petersburg, Euler tackled the now famous problem of the seven bridges of Königsberg. His contribution to this problem is often cited as the birth of graph theory and topology. David S. Richeson (8 March 2012). Euler's Gem: The Polyhedron Formula and the Birth of Topology. Princeton University Press. p. 100. ISBN 1-4008-3856-8. I discovered the works of Euler and my perception of the nature of mathematics underwent a dramatic transformation. I was de-Bourbakized, stopped believing in sets, and was expelled from the Cantorian paradise. I still believe in abstraction, but now I know that one ends with abstraction, not starts with it. I learned that one has to adapt abstractions to reality and not the other way around. Mathematics stopped being a science of theories but reappeared to me as a science of numbers and shapes. As analysis was more cultivated, it gained a predominancy over geometry; being found to be a far more powerful instrument for obtaining results; and possessing a beauty and an evidence, which, though different from those of geometry, had great attractions for minds to which they became familiar. 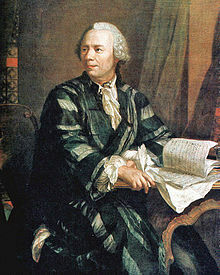 The person who did most to give to analysis the generality and symmetry which are now its pride, was also the person who made Mechanics analytical; I mean Euler. William Whewell, History of the Inductive Sciences (1859) Vol. 1, pp. 363-363. Euler and "Fermat's Last Theorem"
Euler's presentation of "The Seven Bridges of Königsberg"
An Evening with Leonhard Euler presented by William Dunham. This page was last edited on 15 August 2018, at 16:23.